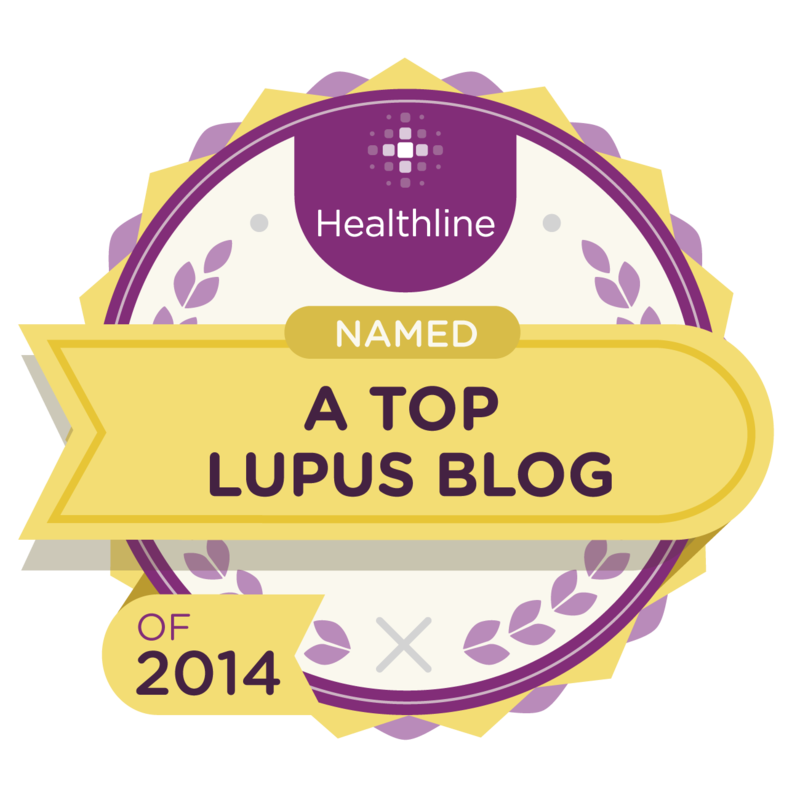 When I was first diagnosed with lupus, I didn't know where to turn for support. That's not unusual. In some places there are great, well-established support groups, in other places, there isn't. Support groups have to be started by someone. 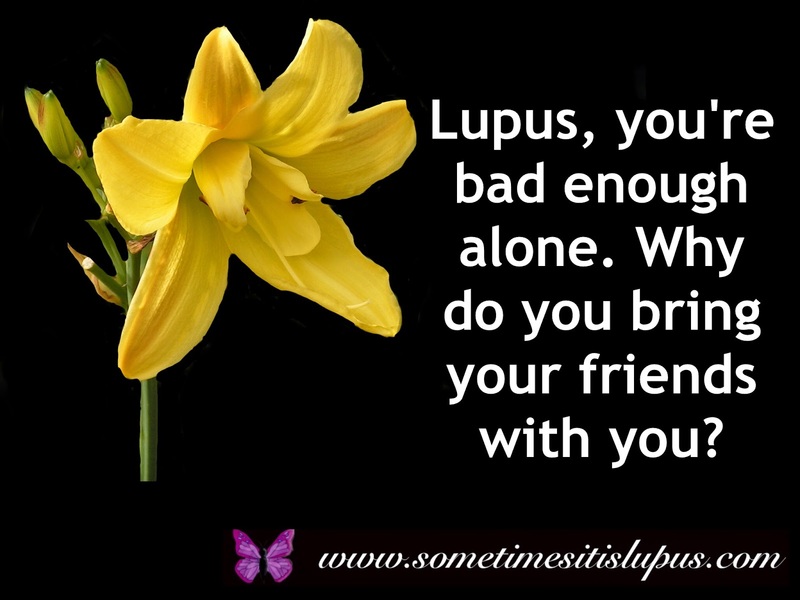 I eventually found the Lupus Association of Queensland, not because there was some big, organised entity with that name. No. It exists because a lovely lupie named Gail couldn't find any support when she was diagnosed, and took the initiative to find some other people in the same situation. She found Annie, and between them, they have organised informal get-togethers on a fairly regular basis for quite a long time now. There are a lot of lupies who owe a great debt of gratitude to these two ladies who, despite their own health problems, went out of their way to create a community. Although ALQ has a name that sounds like some big official organisation, it really is a community, a network of lupies who are there for each other on-line, with an occasional get-together. As people living further away from Brisbane have joined the group online, it's been spreading. There have been get-togethers over a bigger area, as other lupies have realised we can continue what Gail and Annie have started. I had hoped to be able to keep going to Brisbane for get-togethers after I moved, but have found that the drive is getting far too much for me. So I offered to organise a get-together locally. It was a great success, with about eight people there today. A special thank-you to Wray Organic Cafe and Market in Ipswich, for wonderful food, and great service, and for little extra touches (like putting apples for us in each of the place settings) that made us feel very welcome. Thank you to Ipswich Mayor Paul Pisasale, who shared the event on his Facebook page, to help us connect with other lupies in the are who might not have already found us online. I don't have a romantic relationship at the moment, although I did buy a present for a "special someone". (I bought cute shoes for my grand-daughter.) I do have people in my life who I love very much, and I don't think love really needs to be limited to romantic relationships. Saint Valentine's message was about God's love, rather than romantic love. It's bigger than just one other person. 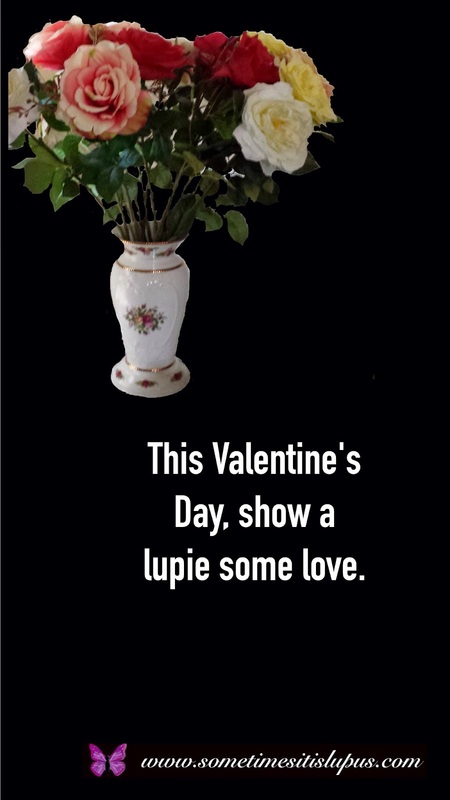 So, if you have a lupie in your life, and you want to show them a little extra love for Valentine's Day (or any other day, for that matter), what can you do? I asked lupies on social media. There were two main themes for answers. The first was: help with the everyday work. Lovely lupie Twyla pretty much summed this up: Some help cleaning my house would be an amazing gift, it's causing me so much anxiety. 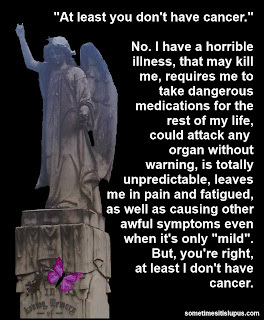 I've always had a tidy house even battling lupus for 24yrs. But the last couple of months I have no strength or energy. Along similar lines, lupies said they'd love premade meals, the washing caught up, and pretty much anything else that would ease the burden of the necessary activities of daily life. Lovely lupie Sarah specified wash, dry AND put away 55 loads of washing. Cooking a nice meal at home (without the crowds of a restaurant) also got the thumbs up. The other big theme was a spa day, or similar. Some suggested massage, one lovely lupie would love a heating pad. There were lupies in favour of manicures and pedicures. (Pedicures are especially valued by those of us who can't reach our own feet anymore.) This doesn't have to be expensive: as lovely lupie Megan said she just wanted chocolate and a hot bubble bath. There are some lupies who would be grateful just for your time, just to have you turn up and watch a movie or whatever. There's some who would just love a nice card, and to know you thought of them. Of course, there's always someone who has different plans. 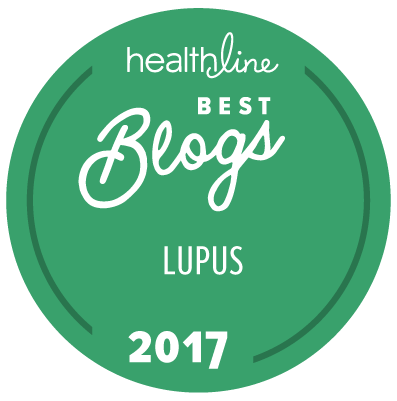 Lovely lupie Pamela's story was unique: I have lupus and heart failure, caused by the lupus, but my husband, in 2007, had a rare tumour in his neck removed. 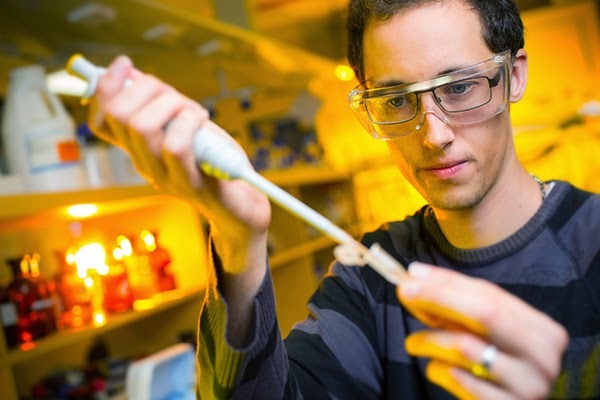 He was the seventh person ever in the world to have had this thing, and was only 36 at the time. He almost died. Luckily he recovered. He was in and out of the hospital the whole year of 2007, and the strain that caused me was unbelievable, especially with a six year old son at home and dealing with my own health issues. His carotid artery burst 10 days post op and we thought we had lost him. But he and I rallied through it and thankfully he's OK now. His first surgery was on Valentine's Day. So since that day we instead celebrate Happy Tumour Removal Day on February 14th and I make some tumour themed dessert that we then hack into with fiendish delight. We've had tumour chocolate candies, a tumour cake (with red oozing pudding in the middle), and my favourite... catastrophic haemorrhage over ice cream (with fake, tasty blood - corn syrup, red dye, and chocolate sauce.) I haven't decided which tumour delight to make this year. Of course, what we all most want is a cure. You can't buy that. But there are lots of institutions working on it, who would be happy for you to donate to them. And we'd all feel loved, if we had a cure. 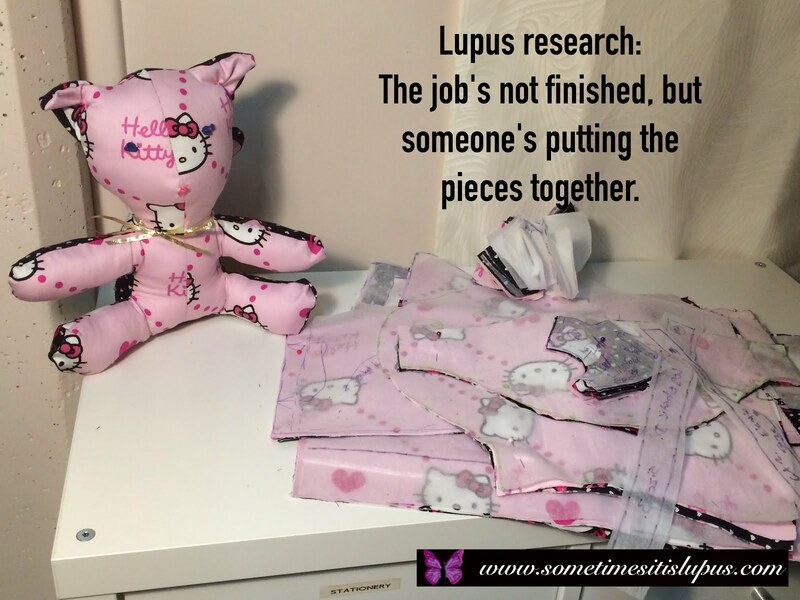 Every now and then a topic comes up on the Sometimes, it is Lupus Facebook Page, that starts a major discussion. Yesterday, a lovely lupie asked about suffering from being hot and sweating. Lots of people have answered to say they have the same issue. No matter what the ambient temperature, they are hot and sweaty. 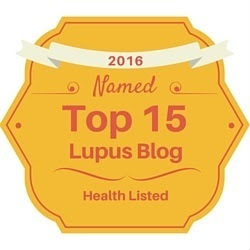 Some attribute it to lupus, some to prednisone, and some suspect they might be entering menopause. There were one or two who are like me. 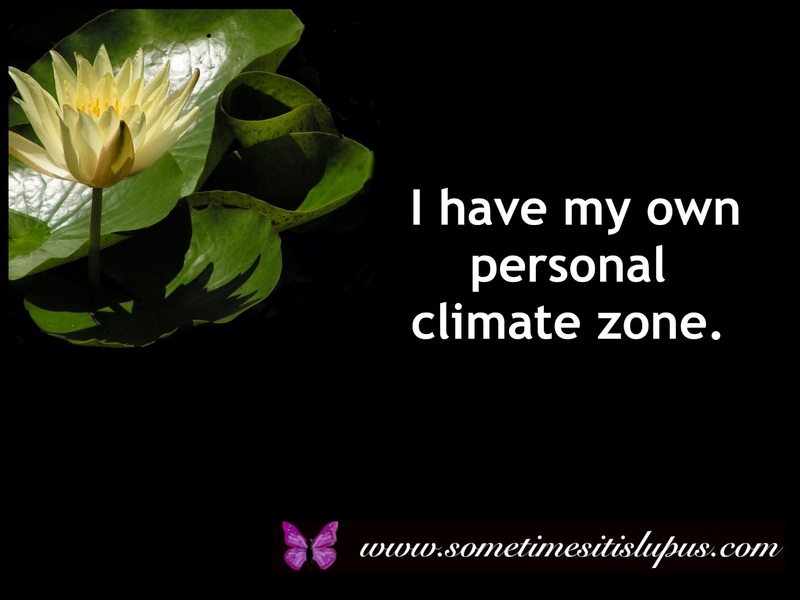 I have my own personal climate zone. Global warming won't touch me. (OK, it might cause cyclones, floods, droughts, etc that could all affect me, but the temperature bit won't bother me.) I've got it all wrapped up. I can be freezing when everyone around me is hot, and I can be hot and sweating when everyone around me is cold. Now, I often do suffer aches and pains from the cold in winter, and extra fatigue in the heat of summer. But I also often am just of doing my own thermal thing, with no relationship whatsoever to the ambient temperature. I can be cold and shivering on a hot day, or hot and sweating on a cold day. At times, out of curiosity, I've taken my temperature, and found it quite normal, despite me suffering from the opposite extreme of temperature to what everyone else is experiencing. Is it just my body being slightly ridiculous? I don't know. I don't know if anyone else knows. All I know is if I'm going away for a couple of days, I need to pack clothes for every possible (or even impossible) weather eventuality. I moved to Ipswich about eight months ago. Time really does fly. I've learned where to shop, and all the basics of survival. Of course, a major part of being part of a community is to build relationships with the people around. That's where I've fallen down. I live in a house with my family. 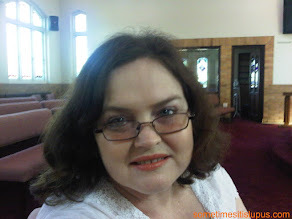 Until recently, I've been going back to my previous community for church. What I have not made the effort to do is to meet new people. It is an effort to meet people. 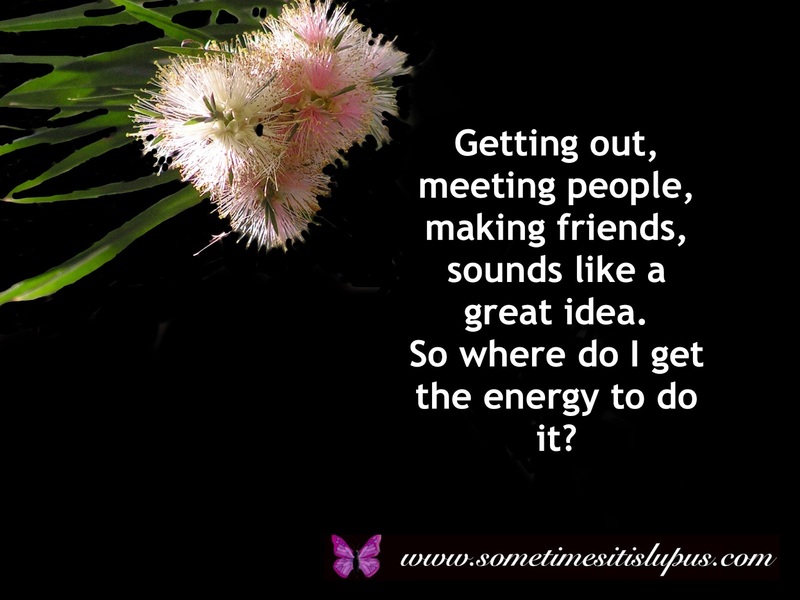 It's an effort partly because I'm an introvert, but also because I really do have to find energy to get out. I'm starting. Near the end of last year, I joined a Writers' Circle, which has given me the chance to meet other people who love writing. I have started to go to the local church in the past few weeks, and have been a couple of times with my granddaughter to the playgroup at the church. Tomorrow is a Presbytery meeting, (Presbytery is the bigger group, that the church congregations in the area belong to), so I can go along, and meet some other people. It's a whole-day meeting, but as a retired minister, who is sick, I'm fairly sure I can get away with leaving early if I run out of energy. I don't really have to go, but I was invited, and it's a great chance to find out who else is in the area. At the end of the month, Lupus Association Queensland is having a get-together here in Ipswich. I booked the restaurant. That's something I'm really looking forward to, as I hope I will meet other lupies who live in my area. There's a Friends of the Library group I'd like to join as well, and also arts and crafts groups. But there's a limit to how many groups I can join. There's so much I'd love to be a part of, and which could help me find a place in the community, but at the same time, I still need to find the energy for basics as well. I came home from Writers' Circle the other day, and promptly went to sleep, waking up, still exhausted, about three hours later. It's like walking a tightrope. I really do need to get out, meet people, make new friends, have interests outside my home and family. But I also need the energy for home and family. And energy is very hard to come by. 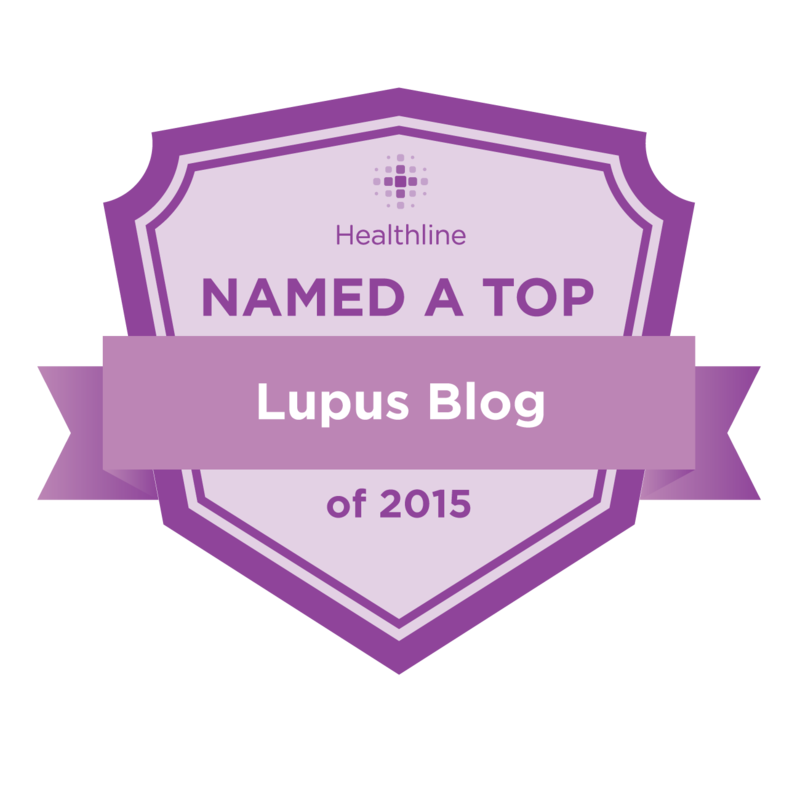 I'm sure there's lots of other lupies out there who are struggling with the same issues. Even if you can't work, there are still things you need to do or want to do. One can't become a hermit, no matter how appealing that may seem on a bad day. There's always a good day coming up some time, and it would be great to have a friend, or even a couple of friends, around to enjoy it with. 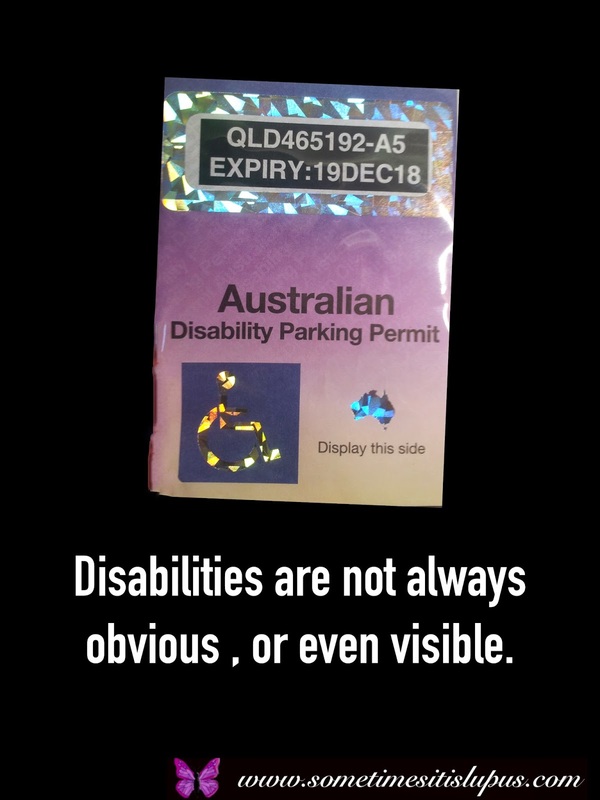 Yesterday, I saw a rather disturbing news story about a "carpark vigilante" leaving a nasty note on the car of people who had a valid disabled parking perming. 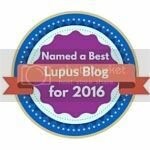 I asked on the Sometimes, it is Lupus Facebook page if any lupies had similar experiences. A disturbing number of people responded that they had been verbally abused, given strange looks, challenged about their right to use a disabled parking space, etc. I realise "carpark vigilantes" think they are doing the right thing. They think people are taking disabled parking spots without needing to. The trouble is, they don't understand a simple, basic, truth. You can't always tell if people have disabilities. Many are not obvious. 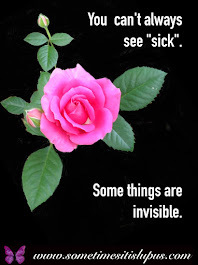 Many are not even visible. 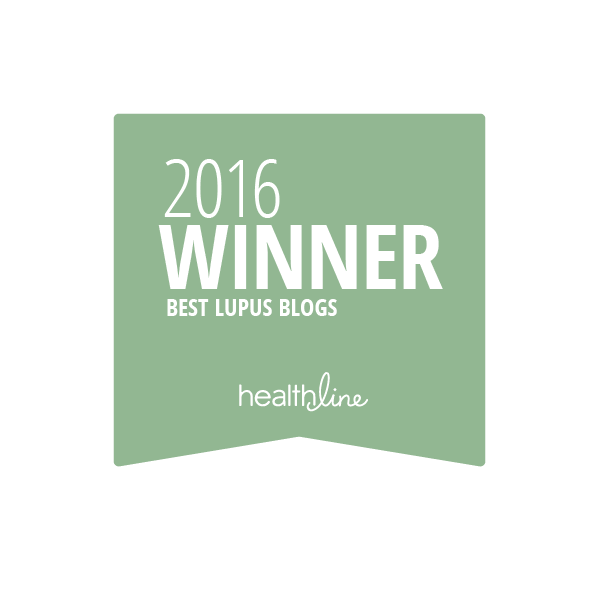 Lupus, like many other chronic illnesses, is not obvious to the casual observer, yet it can make mobility a painful, fatiguing nightmare. To get permits, we need doctors to agree that we need them. It's not automatic. Despite the popular myth, they are not "too easy to get". Permits are issued to people who genuinely need them, whether or not that need is obvious to a random stranger in a carpark. I curse you "carpark vigilante"
tonnes of weight with every step. to make you feel you have run a marathon. deserves it for a lifetime.